Breakfast brand Alpro Soya has brought in ID Experiential to run its festival campaign this summer. 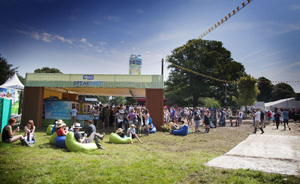 ID will be giving away free Alpro Soya goodies to festival-goers from a 6m tall ‘Breakfest’ table to encourage them to start their day with a healthier breakfast. Consumers will be able to sample products from the Alpro Soya breakfast menu while chilling in a giant cereal bowl, posing for photos for Facebook. Later in the day, they will be able try Alpro Soya deserts or a bowl of strawberries with Alpro Soya cream. TV presenter Emma Willis will be fronting the campaign and will be getting involved in taste challenges on the stand. The activity, which has already visited Cornbury Festival and Latitude, will go on to visit; Kendal Calling (29 - 31 July), The Big Chill (4 - 7 August), Summer Sundae (12 - 14 August) and Bestival (8 - 11 September) and aims to reach more than 163,000 festival-goers.